Joe Navarro has spent a lifetime observing others. For 25 years, as a Special Agent for the FBI, he conducted and supervised interrogations of spies and other dangerous criminals, honing his mastery of nonverbal communication. After retiring from the bureau, he has become a sought-after public speaker and consultant, and an internationally bestselling author. Now, a decade after his groundbreaking book What Every BODY is Saying, Navarro returns with his most ambitious work yet. 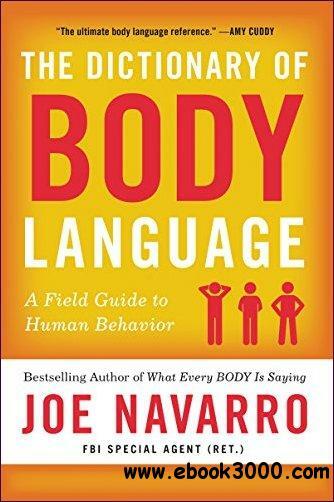 The Dictionary of Body Language is a pioneering "field guide" to nonverbal communication, describing and explaining the more than 400 behaviors that will allow you to gauge anyone's true intentions. Moving from the head down to the feet, Navarro reveals the hidden meanings behind the many conscious and subconscious things we do. Readers will learn how to tell a person's actual feelings from subtle changes in their pupils; the lip behaviors that betray concerns or hidden information; the many different varieties of arm posturing, and what each one means; how the position of our thumbs when we stand akimbo reflects our mental state; and many other fascinating insights to help you both read others and change their perceptions of you. Readers will turn to The Dictionary Body Language again and again-a body language bible for anyone looking to understand what their boss really means, interpret whether a potential romantic partner is interested or not, and learn how to put themselves forward in the most favorable light.